Join the discussion on our forums! Come discuss EVIL Conscriptor over in our dedicated EVIL Conscriptor discussion topic. Kobold! There’s a place you can handle I said kobold! When you’re short in the candle Cast a spell with the E! V! I! L! His voice sounds funny :3 "Take to the stweechs"
Is it just me, or does this guy sound like a Skeram Arnold? 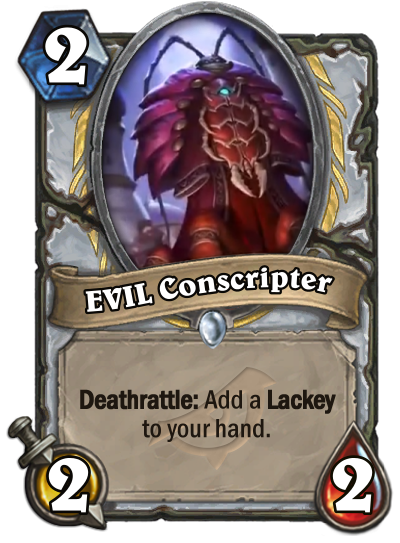 This expansion we have so many good 2-drops that is better than this. I think this will barely see play for some time (maybe later). The only beneficiary of this card is Burgle Rogue with Violet Haze.